Reilly outlined his vision for Opel to be a top European carmaker based on German engineeering. MUNICH – Opel/Vauxhall said today it will cut 8,300 jobs as part of a five-year plan that aims to reduce capacity by a fifth, refresh 80 percent of its product lineup and bring the company into profit by 2012. The General Motors Co. division said the 11 billion euro ($15 billion) plan requires 3.3 billion euros to run the company during the restructuring and it will ask European governments with Opel/Vauxhall operations for loans or loan guarantees of 2.7 billion euros toward the sum. Opel will press ahead with the closure of its factory in Antwerp, Belgium, as part of its plan to reduce capacity to match weaker demand for new cars. The company said the plan includes a strategic push into alternative propulsion technology that will see the launch of an extended range electric vehicle in addition to the Opel Ampera, a sibling to the Chevrolet Volt. "Opel/Vauxhall has a clear vision to be a leading European manufacturer of high quality, desirable automotive products, based on German engineering,” CEO Nick Reilly said in a statement. Reilly said external auditors Warth & Klein have said the carmaker's plan is viable and, based on that assessment, the company has now formally applied for loans or loan guarantees from the German government. Germany is home to half of Opel's 48,000 workforce. Reilly said Opel has asked Germany for 1.5 billion euros and will seek a further 1.2 billion euros from the UK, Spain, Poland and Austria. Opel said the viability plan envisions that 80 percent of the company's carlines will be three years old or less by 2012. This includes eight major launches this year such as the Meriva, Corsa, Movano and Astra Sports Tourer and another four in 2011, including the Ampera, Europe's first extended range electric car. Opel will also spend 1 billion euros on fuel-efficient powertrain technology including introducing pure battery-electric vehicles in smaller-size segments, start/stop technology, downsized engines and expanding LPG and CNG applications. The company also has accelerated efforts to introduce a minicar below its Corsa subcompact Corsa and will make a strong push in the light commercial vehicle business. Opel also is studying whether it can profitably export vehicles to Asia-Pacific and the Middle East, a demand that has come from labor unions in a bid to boost unit sales and keep factories busy. Reilly asked labor representatives to accept the plan. Labor leaders and management have clashed over plans to close Antwerp, a move one union leader called a "declaration of war." Demanding that Antwerp stay open, labor has frozen negotiations over contributing 265 million euros in annual savings over the next five years. Representatives of European engineering unions plan to meet in Brussels on Feb. 23 to discuss the next steps at Opel. The 8,300 job cuts include 4,000 in Germany and will be spread out across most of Europe. The reduction include the loss of 1,300 employees in sales and administration and 7,000 jobs in manufacturing. Once the capacity reduction is implemented, Opel expects to run at 112 percent of its capacity on a two-shift basis and 87 percent on a three-shift basis. It says it will have sufficient upside potential once the market starts to recover. Reilly's plan for Opel to break even by 2011 and be profitable by 2012 is based on economic forecasts that 13.4 million cars will be sold in Western Europe this year, a reduction of more than 20 percent from 2007, and a continuing weak market "for quite some time." 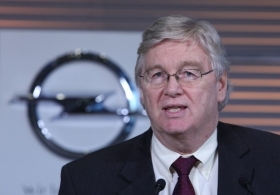 Reilly has said that Opel has enough liquidity to operate "well into the second quarter." Future products will be developed at GM's international technical development center in Ruesselsheim. "If they are based on a vehicle architecture developed elsewhere, they will return to Rüsselsheim early to ensure they deliver on the Opel/Vauxhall brand promise," a company statement said. Opel said its Ampera electric car will be built by GM in the U.S. for an initial two to three years.